What does "legalize cachaça"mean? How can a liquor be "illegal" (apart from moonshine)? Cachaça technically is not illegal BUT up until recently, it used to be categorized under the rum category. Leblon Cachaça (very) cleverly brought this issue to light through their ad campaign*. To celebrate the United States recognizing Cachaça as a distinctive product of Brazil, Leblon threw a little get together over at Lani Kai, which I was lucky enough to attend. Now that I've got that out of the way let's move onto the cocktails, no? Obviously the main focus was going to be Leblon Cachaça. They were offering four unique cocktails, all made with fresh ingredients. No drink mix over here! Lani Kai can be best described as "a restaurant and artisanal cocktail lounge located in the Soho district of New York City. The beverage program, modern tropical ambiance and new American food menu with a Polynesian flair", so think tropical drinks, like mai tais etc. The drink you see above is called Bermuda Triangle. It contains "Cachaça, coconut, kalamansi and lychee juice". Isn't it pretty? Have I mentioned orchids are my favorite flowers? Not only did it look good, it tasted great as well. I wasn't sure what to think at first since I'm not a huge lychee fan. However I happily put those doubts to rest with this cocktail. My main issue with lychee, I think, is that it can be rather overpowering if used improperly. The mixologists over at Lani Kai have gotten this down to a science. The coconut balanced out the lychee taste nicely, and you could still taste the natural sweetness of cachaça. You can't mention cachaça without talking about caipirinhas, am I right? Simply put, a caipirinha is comprised of muddled limes, sugar, ice and cachaça. Think of a mojito except without the mint and substitute rum with cachaça. Sounds so simple, doesn't it? If you were to ask what's my favorite cocktail, a well made caipirinha is usually my answer (although I do love a French martini from time to time). 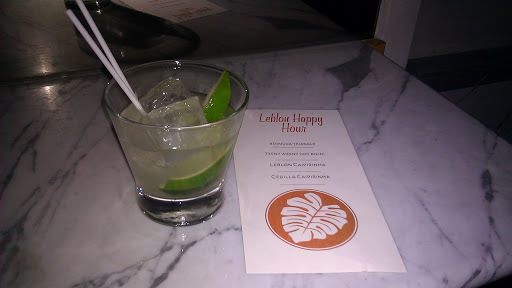 The Leblon Caipirinha at Lani Kai was expertly made, bursting with lime flavor, tasting of summer. 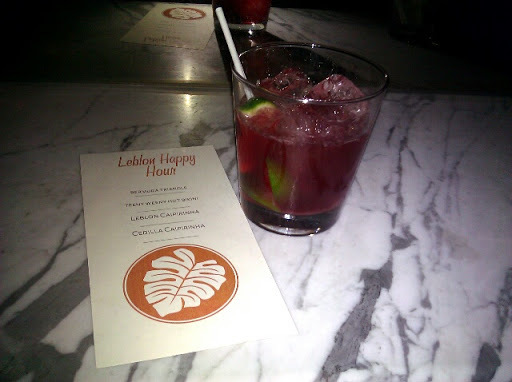 Here is the last cocktail I tried that night, the Cedilla Caipirinha. Have you guys heard about Açai and all of it's antioxidant properties? Personally I'm not sure what to make of all its nutritional claims, but what I do know is it tastes yummy. Cedilla is a new liqueur that was recently launched, comprised of Açai berries macerated in Leblon Cachaça. What I love about Cedilla is that it is fruity without being cloying, and is easy to incorporate into cocktails. Here is a prime example, using Cedilla in the traditional caipirinha. The end result was a smooth, tasty drink that wasn't super sweet. If you can get your hands on some, I recommend using Cedilla in the same manner you might use Chambord or even Cointreau (think margaritas). I honestly think this would taste amazing in a Tequila Sunset. All in all, it was a very fun, booze-filled event. Which one of these cocktails do you think you would enjoy? Ohhh, the "Bermuda Triangle" is calling my name. It looks so pretty, and so delicious! Love lychee, and blended drinks in general. Mmmmm. I'd love to try Cachaça! I hope I can find it somewhere I am (maybe under the erroneous name "Brazilian rum"?). It was super yummy, very similar to a piña colada. It's a lot easier to find cachaça nowadays, since caipirinhas have become so popular. Let me know if you check it out. I am not much of an alcohol fan, and the Capirinha is probably my least favorite of all, but that Bermuda Triangle sounds.... *deep sigh* ... I want it! 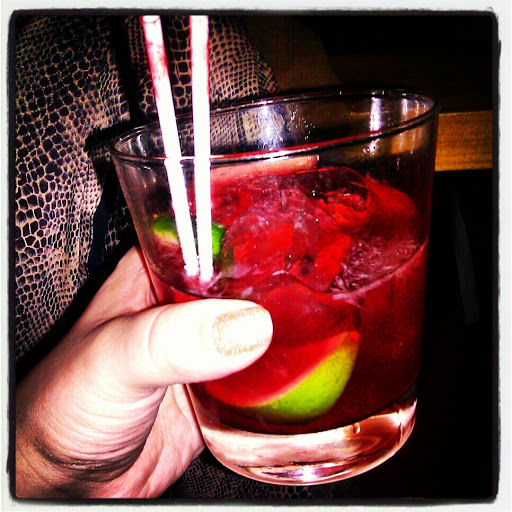 I loved that night celebrating the "legalization" of Cachaça! What major were you? I was a year behind Katty, so maybe we've bumped into each other. Already subbed to your blog, us LaG heads have to stick together! Oooh those drinks look so good! I'm not the biggest lychee fan either but combined with coconut sounds like it could actually be really good! It was, it tasted like a twist on a traditional piña colada. Here in Europe some liquors are illegal simply because thet have too many degrees (i. e. Absinth). The other solution is to lower their content in alcohol to the limits permitted (around 42%). Here they make a deal over the amount of alcohol per drink. In some states, a drink can have up to 5 shots (like a Long Island Iced Tea), in other states, you can only have 4 shots. Most spirits are generally 80 proof (40%), but you can sometimes find a higher proof (i.e. Baracardi 151) Thanks for checking out my blog!